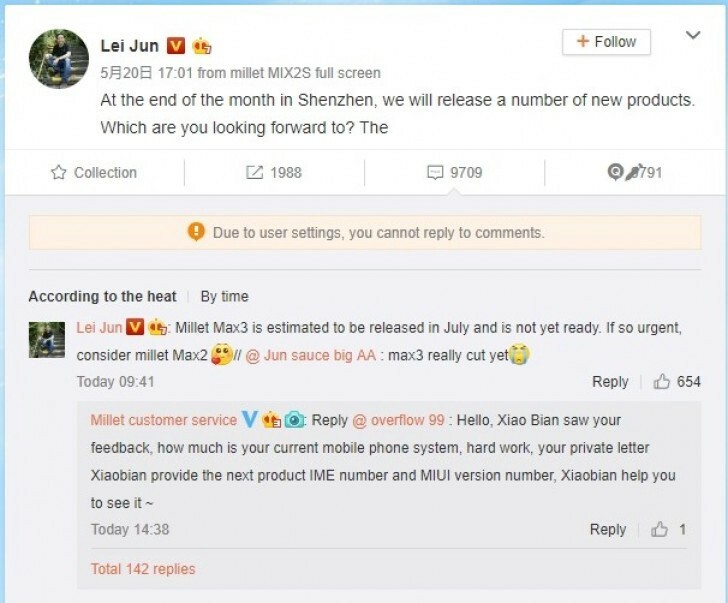 The Mi Max 3 launch date has been slated to be this July after Xiaomi’s CEO Lei Jun posted the announcement on a social network. The Mi Max 3 would serve as the successor to the Max 2. Fans are excited as the long pending Mi Max 3 launch date is approaching soon. The Mi Max 2 which was released last year needed a pending update, and fans have been waiting for a long time. Well, it seems that the wait has finally ended as Xiaomi is hosting an event of its own. Rumors have been made that Xiaomi will be releasing the smartphone at a special event which is to be held at the end of this month, but that might be unlikely. The event marks the release of a few products namely, the Mi 8th Anniversary Edition flagship and the Mi Band. And that is not all. Xiaomi is also reported to release the Mi 8 which will also feature an on-screen fingerprint reader like the Vivo X21. Now that the CEO has stepped up and announced the date, rumors can now be laid to rest. The Mi Max 3 is expected to feature some really interesting features like wireless charging, iris scanner and also a huge 5,500mAh battery. Also spotted is a 6.99-inch screen. Reports have also supported that a Snapdragon 635 processor will be powering up the phone. About the camera, a dual-camera setup is expected on the rear. The Max 3 will be the next release after the Xiaomi Redmi S2. That is a huge upgrade from last years Mi Max 2. Though the battery is just a minor upgrade from the Max 2’s 5300 mAh battery, the processor has received a huge boost from the Snapdragon 625 processor. The screen is also receiving a well-deserved upgrade, and a bezel-less display is expected, contrary to the 2017 look that the Mi Max 2 sported. Since these are just reports, one can confirm only when the Mi Max 3 launch is done and dusted!